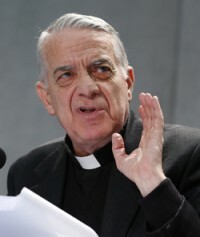 VATICAN CITY (CNS) — Anyone who still believes the abuse crisis is an “American” or “Western” problem must become properly informed, face reality and realize problems may be hidden and explode in the future, said Jesuit Father Federico Lombardi. And those who think too much talk and attention about abuse only blows the situation out of proportion or that it is time to change the topic are following “a mistaken path,” he said in the Jesuit journal, La Civilta Cattolica. “If the issue is not fully confronted in all of its various dimensions, the church will continue to find itself facing one crisis after another, the credibility of (the church) and all of her priests will remain seriously wounded and, above all, the essence of her mission will suffer — that of proclaiming the Gospel and its educational work for children and young people, which for centuries has been one of the most beautiful and precious aspects of her service for humanity,” he wrote. The article, “In the Run-up to the Meeting of Bishops on the Protection of Minors,” was sent to journalists Dec. 13 ahead of the issue’s Dec. 15 publication date. The Rome-based biweekly magazine is reviewed by the Vatican Secretariat of State before publication. Father Lombardi, who served as head of the Vatican press office from 2006 to 2016, is president of the board of directors of the Joseph Ratzinger-Benedict XVI Foundation and is a contributing writer to the Jesuit journal. The article, which as of Dec. 13 was available only in Italian, looked at the aims and intentions of the summit Pope Francis convoked at the Vatican Feb. 21-24 for the presidents of bishops’ conferences, representatives of religious orders and heads of Vatican dicasteries. “The entire church must feel in solidarity, above all with the victims, with their families and with their church communities that have been wounded by the scandals,” he wrote. Pope Francis, he added, has also widened the scope of abuse to include not just sexual abuse but the abuse of power and of conscience and the corruption of authority, which is no longer lived as service but as the wielding of power. While many lessons already have been learned, “there are also many open questions” left to address, he said. Every bishops’ conference, bishop and religious superior must recognize their responsibility before God, the church and society, he said. In many cases, the seriousness of the problem of abuse and the deep amount of suffering it causes still have not sunk in, Father Lombardi wrote. People do not need a theoretical understanding, but actual concrete awareness of the damage caused, and that will push people to overcome “laziness, fears and very dangerous resistance” and to leap into action. “Often one continues to delude oneself that it is mainly a ‘Western’ or else an ‘American’ or ‘Anglophone’ problem and with incredible naivete, thinks that (the problem) may be marginal in one’s own country,” he wrote. NEXT: English cardinal shocked to learn vicar sent two pedophiles to U.S.